Using new CMOS sensor technology, the SVmini-209 delivers high-quality pictures at a low price. 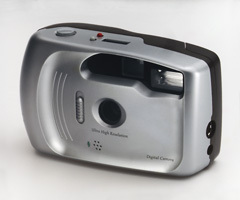 Until recently, digital still cameras were either inexpensive, low-resolution devices or high-end units for people who need professional-grade images. But a new camera from Sound Vision, the SVmini-209 , delivers ultrahigh-quality digital images at a relatively bargain price. Sound Vision itself sells the SVmini and also OEMs it to Vivitar and others. The key to this camera is its CMOS sensor, developed with VLSI Vision (Edinburgh, Scotland). The model I tested is Sound Vision's second-generation camera. The first, sold as the Vivitar ViviCam 3000 and Umax Sharpset 8000, was the fi rst digital still camera on the market to use a CMOS sensor instead of a charge-coupled device (CCD) sensor. High-resol ution CMOS sensors are less expensive than comparable CCDs, and they also require considerably less power and support circuitry, which means dramatically increased battery life. The SVmini-209's four-color sensor produces a native resolution of 1000 by 800 pixels (10 bits per color). A Texas Instruments TMS-320C209 digital signal processor extrapolates the image to 2000 by 1600, a truly impressive 3.2-megapixel image. A noise-reduction algorithm in the camera software removes graininess from images taken in poor light. The camera holds 1 MB of DRAM and 1 MB of flash memory. System software takes 1.5 MB, leaving about 500 KB for image storage. The SVmini uses variable JPEG compression, which you adjust using either an on-camera LCD or a serial connection, to balance image quality against storage space: 80 percent compression (100 KB per image) give s optimal quality; 40 percent (50 KB) produces some artifacts. The 500-KB internal memory isn't much space for images, so the SVmini has a slot for flash memory cards holding 2 to 16 MB. An adapter will be available for SanDisk MiniPort cards, which use a DOS-compatible file format. The SVmini-209 sports an f/4.0 fixed-focus glass lens, a built-in flash, and a self-timer. There's a built-in microphone for recording brief clips of WAV audio along with each image (although this eats into image-storage space). Windows 95 software included with the camera lets you download and view images through a serial port, set all the camera's parameters, and clear images from memory. Macintosh software is also available. An optional AC adapter extends the life of the six AA batteries. The camera I tested, an early prototype, produced superb images in a variety of lighting conditions. While its CMOS sensor technology is new, the SVmini is obviously riding the wave of the future. It's small, but the SVmini camera captures high-resolution digital images with good color. The SVmini-209 received a coveted 5 star review from BYTE magazine in the November 1997 issue, and according to BYTE: "...it delivers ultra-high quality digital images at a relatively bargain price." Stan Miastkowski is a BYTE consulting editor. You can reach him at mailto:stanm@bix.com.